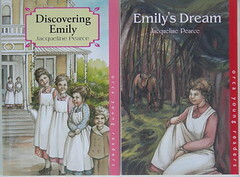 I would like to say a special hello to everyone who has been reading my novels about the childhood of artist Emily Carr (Discovering Emily and Emily’s Dream) — especially Mrs. Fung’s class at Lord Nelson Elementary School! During Spring Break last week I spent a day in Victoria, the city where Emily Carr was born and spent most of her life (1871-1945). Walking around her old neighbourhood, I tried to imagine what it looked like when she was a girl playing in the cow yard beside her house, cutting through her family’s back field to Beacon Hill Park, walking along the road to the James Bay Bridge…. and later, being a landlady at the House of All Sorts (a house built on a piece of her family’s property), raising her bob tail sheep dogs, walking along the streets with her monkey, Woo….. Above: Carr house in the 1860s and me in front of the house last week. Above: The House of All Sorts (at left), which is around the corner from Carr House (Carr House is now a museum you can visit, but the House of All Sorts is a privately owned house with apartments, and there is still a mural that Emily Carr painted on the attic ceiling). The house on the right is where I lived during my last year at University in Victoria (a room-mate and I rented the top floor, just a block away from Carr House, and no, Emily Carr was not still alive when I lived in her neighbourhood). 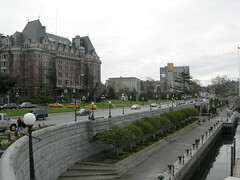 This street in front of the Empress Hotel (photo at left) used to be the James Bay Bridge, which Emily would walk across with her father. The hotel is sitting on what used to be the water of James Bay (the bay was filled in with earth, but sea water still sneaks into the hotel basement at high tide). 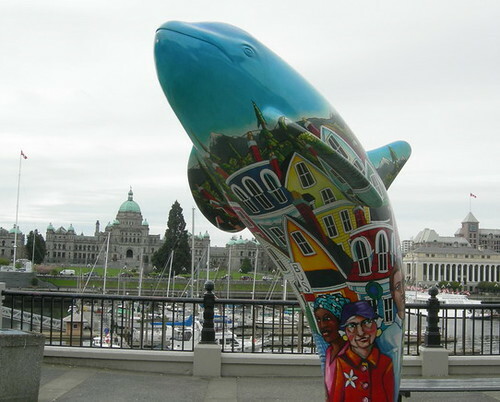 Above: The parliament buildings (behind the whale), which are across from the Empress Hotel and overlooking Victoria’s inner harbour (Emily Carr’s old neighbourhood is right behind them). 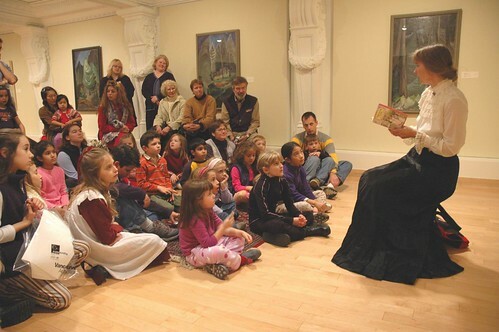 Below: Me dressed in 19th century costume, reading in the Emily Carr section of the Vancouver Art Gallery a couple years ago (my daughter, sitting on the floor at left, is dressed like Emily Carr would have dressed when she was a girl). A couple nights ago, I was just falling asleep when I was startled into alertness by a racket on the roof above my head. My first fear was that the rats had returned to my attic, but judging by the sound, these would have been REALLY BIG rats! This morning, our garbage can was over-turned, garbage was strewn over the grass, and my daughter discovered raccoon paw prints in the silt at the bottom of a bucket filled with rain water, which was sitting close to the garbage can. Mystery of the night visitors solved. We had inadvertantly set up the perfect raccoon dinner stop: garbage can buffet and right beside it, a place to wash the food. 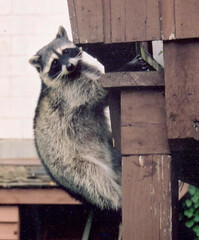 Here’s a photo of a raccoon climbing up my back porch a couple years ago. About noon today I decided to take a break from writing and go out for a Starbucks hot chocolate. I just missed the bus, which was frustrating, and had to walk to the Skytrain. 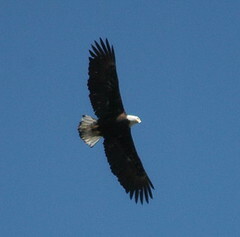 Half way there, I looked up to see a bald eagle circling low in the blue sky (yes, blue sky, not gray and rainy). The eagle continued to circle above me the whole rest of my walk. Eagle sightings always feel significant — like you’ve been honored by their presence or they’re markers of something important that’s happening or about to happen…. At the very least, they remind us to pay attention…. And if I hadn’t missed the bus, I would have missed this one. I have a backlog of topics I’d like to post about, but I’ve been trying to focus on finishing my current novel, which is due next week (I’ve already asked my editor for two deadline extensions, so this is it!). Immersion in writing about Japan has got me, not only wishing I could go back for another visit, but also craving a different Japanese food each week. Last week it was yam sushi, this week it’s Kakinotane peanuts, a few weeks ago it was yuzu (a kind of citrus fruit) tea, before that it was Gaba chocolates, vegetable tempura, and so on….. 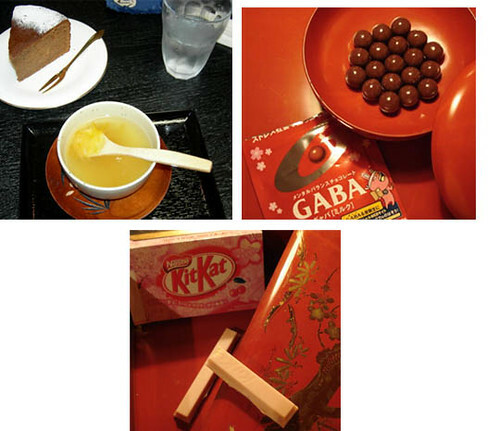 So, for now I’ll leave you with three images to taste: a delicious cup of yuzu tea and chocolate cake (which I had at a tiny cafe in Nara after ducking in out of the rain), Gaba chocolates, and cherry blossom KitKat (apparently only available in Japan and only during cherry blossom season, and especially popular with students taking exams — as a kind of edible good luck charm).